We’d love your help. Let us know what’s wrong with this preview of The Image by Daniel J. Boorstin. To ask other readers questions about The Image, please sign up. My dad wrote this book. I remember stamping the pages with a rubber number-stamper on our dining room table. He'd spent ten years on his latest volume of The Americans; this he wrote in three months. This endures. 5+ stars This book should be mandatory reading. Boorstin, Librarian of Congress emeritus, is an outstanding social historian who defines pseudo-events as events created to promote. Generally, these events have no intrinsic newsworthiness. They are not spontaneous, they are usually arranged for the convenience of the media, their relationship to reality is ambiguous and they are intended to be self-fulfilling. The news media hungers for anything to put in its pages. We are besieged with radio, TV, 5+ stars This book should be mandatory reading. The news media hungers for anything to put in its pages. We are besieged with radio, TV, 24-hour news, magazines, newspapers, books, each requiring "information." Events are now planned to occur at the best time for news broadcasts. It has become terribly important that something always be happening. Pseudo-events help fill the vacuum. Boorstin is like the little boy who shouts, "the emperor has no clothes." He helps us to peel away the veneer, the false fronts. McCarthy was an expert at creating reportable events that had "an ambiguous relationship to the underlying reality." He invented the morning news conference that announced an afternoon press conference. At the afternoon conference he would proclaim that a witness was not ready or could not be found. The headlines would trumpet, "Mystery witness sought!" Reporters loved him for supplying so much material. Even those who hated him became his best allies. News has become a dramatic presentation. The president speaking "off-the-cuff" is now more newsworthy than the original prepared speech. It has become difficult to distinguish between the actual and the pseudo event. Organizations manipulate the media to create events all the while castigating the press for opinions on the editorial page. Boorstin argues we now confuse fame with greatness. It is very easy to become famous. By confusing heroes with celebrities "we deny ourselves the role-models of heroes, truly great individuals." The way we travel has also changed. It used to be people traveled to experience a different culture or way of life or language. Rarely did it not affect a person's view of the world. Now more and more people travel, yet are influenced less. We seek to re-create an environment similar to the one we left. Boorstin cites digests as an example of how forms have dissolved, "the shadow has become the substance." Originally conceived to lead the reader to the original, they now exist as an end product; another step away from the actual experience. Reader's Digest has perfected the form to the point where articles are "planted" in magazines so they can be digested in its publication. By 1943, 60% of all its articles were abridgements of full-length articles commissioned for original publication elsewhere by Reader's Digest. The demand for digested articles was so great it had forced the creation of articles to meet the demand: a literary pseudo-event. We are now engaged in a competition to create more credible images. The images have become more real than reality. We can persuade ourselves of our image. But we have lost sight of the need to create ideals. The central point of the book is so incisive that it not only survived the major technological and cultural shifts of the last 50 years but is made stronger by them: Most ofe take as important or news is image and artifice. Think aboutpress conferences to announce press conferences, awards, articles about how much money celebrities make, news leaks, news breaks, annual "Best of" list, press releases, "no comment", et al. None of it is real. As in, if it hadn't been known in advance that they'd g The central point of the book is so incisive that it not only survived the major technological and cultural shifts of the last 50 years but is made stronger by them: Most ofe take as important or news is image and artifice. Think aboutpress conferences to announce press conferences, awards, articles about how much money celebrities make, news leaks, news breaks, annual "Best of" list, press releases, "no comment", et al. None of it is real. As in, if it hadn't been known in advance that they'd generate press they wouldn't have occurred. A nice example is foreign policy. A president might say he wants to increase our "prestige" abroad. What does that even mean? As far as I can tell it means nothing, except perhaps a naive desire to receive credit for something you're not taking any action to produce. The rest of the book is on what he calls "unreality", a place similar to the dream would where many bloggers live. It remains in line with the central premise, that the prevalence of news and newspapers has given us the belief that we can change reality by altering what reporters tell us. "Always the play; never the thing"
A superbly titled and entirely prescient book, this one. As America's Graphic Revolution was spiraling with television, movies, and other 'images' created for easy consumption, Boorstin wrote about how there is simultaneously much more and much less to everything we see. This book was written in 1961, so many of the examples he uses seem so innocuous and quaint compared to what we're accustomed to today. Boorstin died in 2004, so how did he not go crazy through "Always the play; never the thing"
A superbly titled and entirely prescient book, this one. As America's Graphic Revolution was spiraling with television, movies, and other 'images' created for easy consumption, Boorstin wrote about how there is simultaneously much more and much less to everything we see. This book was written in 1961, so many of the examples he uses seem so innocuous and quaint compared to what we're accustomed to today. Boorstin died in 2004, so how did he not go crazy through the Lewinsky scandal, Paris Hilton, 'reality' television, the Colbert Report, the 24-hour news cycle, and internet news aggregates / blogs? Skimmed thoroughly. Would love to have an excuse, such as a book club discussion, to read carefully as it's well-written and still relevant. However, much info. is that which I've already encountered elsewhere, or figured out for myself, and given that I'm on a time crunch, I chose not to read every word. Recommended to anyone interested in sociology, advertising, popular media, politics. Good thing Daniel Boorstin is deceased. Facebook would send him into despair - but it would not surprise him, as it is a logical extension of what this book is all about. The root of the problem he addresses is we demand and expect far more than real life can give, thanks to the illusions that the Graphic Revolution presents to us. The Graphic Revolution is the coming of media (print, sound, video) that allow the creation of the pseudo-world, the artificial world that implies that all things are Good thing Daniel Boorstin is deceased. Facebook would send him into despair - but it would not surprise him, as it is a logical extension of what this book is all about. The root of the problem he addresses is we demand and expect far more than real life can give, thanks to the illusions that the Graphic Revolution presents to us. The Graphic Revolution is the coming of media (print, sound, video) that allow the creation of the pseudo-world, the artificial world that implies that all things are possible. In our desire, we have come to prefer illusion to reality because reality can't possibly come up to our expectations. This book was written in 1961 and, though the celebrities mentioned are from the 1920's to the 1950's, Boorstin's thesis holds true today. We live in a self-referential world of images, of pseudo-news (packaged "news" instead of spontaneous events), of celebrities that are known for being known, of "adventure" vacations that are packaged so that nothing unexpected will happen. Never bored, and never resentful of the illusions that make up our world, we are instead fascinated even by the process that creates them. We love to watch how a movie is made, we are eager to hear about the ad campaigns that are designed to beguile us. Reality TV is as far from reality as can be, but we watch. We are pleased and entertained yet uncomfortable and never more than temporarily satisfied by living with illusion rather than reality. The image that things and people convey has become what we deal with rather than the actual things and people themselves. Boorstin is dead on when he speaks of businesses redesigning logos and ad campaigns in order to appear in a different way to the public - while the actual nuts and bolts company and product changes not at all. Think of BP as "Beyond Petroleum" with pleasing flowery green and yellow colors at the gas stations. Here is something right from the newspaper today in a story about South Africa - "During the past month, this country has shown its best side to the world. Leaders from both government and business have declared that South Africa has successfully "rebranded" itself, recasting an image tarnished by AIDS, poverty and corruption, into one of geniality, prosperity and competence." Boorstin would ask - to the South African on the street what has "rebranding" meant? Nothing. And so it goes with everything. Go to Africa and stay in places that could just as well be the United States. Take a "safari" in total safety with no unexpected encounters. In short, we do not live lives of real experience. We are removed from the real and constantly exposed to reflections of our own expectations. Taking pictures of the Grand Canyon with a new electronic gadget can more than equal the thrill of seeing the Grand Canyon itself. The big picture window that allows others to see us in our living room has replaced the porch where we could talk with our neighbors. Need I mention the common "chandelier window" on so many recently built houses that serves no purpose but image building? Following others on Facebook has replaced seeing people in the flesh. Things of no consequence on Twitter are considered news worth following. This guy Boorstin had the whole thing pegged 50 years ago. The author is of the generation that revered the spoken and written word (he was Librarian of Congress) so he could see how things were going from a vantage point that hardly remains in the 21st century. I give only 4 stars because I think early chapters in the book give too many examples. The pervasiveness of what he is trying to illustrate is so familiar now that the examples are un-necessary to the point of tedium, though they are interestingly quaint. Skip to chapter five and the freight train of his idea rolls in at full speed. This book was written in the 1960s, so it obviously doesn't resonate with me as strikingly as Chris Hedges' Empire of Illusion (2009) or Neil Postman's Amusing Ourselves to Death (1985). However, Boorstin does point out trends that were beginning to take America by storm in the 50s and 60s and still persist today. These include the changing role of the news media from relaying spontaneous news (crime, accidents, governmental proceedings) to creating news to be reported (press releases, publicity This book was written in the 1960s, so it obviously doesn't resonate with me as strikingly as Chris Hedges' Empire of Illusion (2009) or Neil Postman's Amusing Ourselves to Death (1985). However, Boorstin does point out trends that were beginning to take America by storm in the 50s and 60s and still persist today. These include the changing role of the news media from relaying spontaneous news (crime, accidents, governmental proceedings) to creating news to be reported (press releases, publicity stunts, interviews, etc. ); the replacement of the hero with the celebrity; the replacement of the traveler with the tourist; the increasing ubiquity of different forms of art melding into one another (books becoming movies becoming television shows, etc. ); the rise of the importance of the public image to both companies and consumers; and finally, the reliance on creating an "image" of America that is suitable for exportation to other countries and suitable for consumption by Americans themselves. If I were to sum up the problem Boorstin describes, it would be one of "secondhandness." For some reason, we Americans tend to prefer contrived experiences over authentic ones, likely as an outgrowth of our love of control. For example, Reader's Digests were extremely popular in Boorstin's time, despite the fact that they contained nothing of originality, only reprints of articles that appeared elsewhere. But Americans liked the feeling of thinking they were reading only the best of the best and not wasting their time with subpar articles. Additionally, traveling used to be inherently unpredictable and dangerous and thus adventurous and character-building. Tourism largely replaced traveling as as safe, predictable alternative, although the contrivance of the experience stripped it of most of its meaning and importance. I always try to extract lessons from the books that I read. Many of the lessons are not exactly new to me. They are familiar as vague, undefined discomforts which I have been unable to sufficiently explain, to others or myself, thus my interest in cultural criticism as a search for not only confirmation but understanding of my own discomfort. For example, I don't travel often because the times in which I have, I have always felt that I came back unchanged. Sure, I had a new experience to talk about, but I was by no means more interesting as a person. Boorstin has now explained that my "traveling" was nothing more than "touring," thus why it felt so empty and meaningless. 1. Especially today, one must be very wary of what news one consumes. Chances are, much of it is pseudo-news, of no real import or relevance to one's daily life. While a knowledge of large-scale issues can be considered a good thing, especially in a global economy, there is such a glut of news and information available that if one doesn't purposefully decide what is important, not because it matters but because it is relevant, it is too easy to drown in the overload and be rendered useless to do anything about it because all of one's time is spent learning of it. 2. Pretty much just ignore celebrities. Before you start hero-worshipping them, ask yourself if they are not simply entertainers, and if they are truly worthy of the word "hero." Redefine what a hero looks like to you. 3. Stop being a tourist. Just go places. Plan as little as possible if you want to get an authentic experience. If you are too scared of the dangers that entails, you are not ready to be a traveler. 5. Beware brand loyalty or any decision based on the image of something. Do not buy Apple products because Apple is a cool brand. Likewise, do not buy the new Google phone just because Google is a cool anti-Apple brand. Look at product performance only and ignore brand image. It doesn't mean anything. 6. Do not let anyone tell you what America is supposed to look like. America is only what it is, not what people think it should be. If the people are not free, it is not the land of the free. If the people are no longer primarily Christian, it is not a Christian nation. See things for what they are, not what they are sold as. The Image is a modern classic of sociology first published in 1961. Anyone reading it today will probably be struck by how Boorstin identifies trends that are so prevalent today -especially the way society is fixated on images rather than the underlying reality. Some might call Boorstin prescient but it's more accurate to say that he was an astute observer of what was already happening in the mid-20th century as the era of television was making sweeping changes in society. The paperback copy I pi The Image is a modern classic of sociology first published in 1961. Anyone reading it today will probably be struck by how Boorstin identifies trends that are so prevalent today -especially the way society is fixated on images rather than the underlying reality. Some might call Boorstin prescient but it's more accurate to say that he was an astute observer of what was already happening in the mid-20th century as the era of television was making sweeping changes in society. The paperback copy I picked up is a 25th-anniversary edition, with an introduction from the author and an afterword by conservative cultural critic George Will, written in 1987. So reading this today is like a time machine with multiple stops. For in the 1980s, the internet was still a decade in the future but the MTV era was well underway. This is one of two influential books from the 1960s that deals with a similar topic, the other being Society of the Spectacle, by Guy Debord. The latter is still on my reading list and from browsing through it in used bookstores I expect it to be the more challenging of the two, as European philosophers can be rather abstract. By contrast, Daniel Boorstin writes in the straightforward manner of an American traditionalist. The subtitle of this book tells a great deal of the story: "A guide to pseudo-events in America." Boorstin is obsessed with the phrase "pseudo-event" and it's used throughout the book. A pseudo-event is something that's contrived, such as a press conference or publicity shoot as opposed to a happening that occurs spontaneously. Boorstin's main point is that society is increasingly made up of pseudo-events. When you think that he wrote this some half century before the advent of reality TV and social media, it's quite amazing. The Image recounts trends that are so familiar now that we barely notice them but that was just getting underway in the mid-20th century, such as the staged quality of presidential campaigns and debates and celebrity product endorsements. Speaking of celebrities, Boorstin may have been one of the first to thoroughly examine and critique the whole idea. Celebrities, he notes, have largely supplanted heroes. While heroes are known for their character and great feats, celebrities are famous for being famous. As Boorstin puts it, "a celebrity is a person who is known for his well-knowness." This is something that people started to note with the rise of the celebrities such as Paris Hilton and the Kardashians in the early 21st century. Apparently, however, it dates back quite a bit before that. Boorstin explores the case of Charles Lindbergh at length, seeing his story as one of the first truly modern celebrities. Lindbergh was initially a hero in the traditional sense after making the first nonstop solo flight from New York to Paris. However, he quickly turned into a mere celebrity whose every movement was reported. When his baby was kidnapped, speculations and rumors filled the media for many months. One of the most interesting chapters is "From Traveler to Tourist: the Lost Art of Travel," which describes the emergence of another major trend as modern mass tourism supplanted the age of leisurely travel. Boorstin and other cultural critics look on with horror as cruise ships, commercial airlines, hotel chains, and the emerging American highway system do away with differences and bring about the modern, increasingly homogenized world. Boorstin explains how tourism has created a whole new category of pseudo-events, such as museums and other attractions set up solely to entertain tourists and native dances and rituals performed outside of their original context and reimagined as entertainment. Of course, a lot of what Boorstin is analyzing here, especially in the chapter about travel but also throughout the book, is about a world that's increasingly populated, educated, and democratic. He explicitly mentions that prior to the 20th century, long-distance travel was mostly limited to the wealthy. He similarly complains about the phenomenon of bestsellers, which are books that are considered great because they sell well. As with travel, however, there's also the underlying issue of more people reading and buying books than ever before. The mass appeal of books began when mass printing became possible and literacy rates increased. In all fields, there tends to be a trade-off between quality and mass participation. As more people than ever before read, travel, vote and participate in politics, watch TV and movies, and otherwise partake of culture, and at the same time technology accelerates, more events and items take on a mass-produced quality. As Boorstin also laments, works of art were once all unique. Now, anyone can buy a poster, postcard or other reproduction of any painting. This is yet another example of where we have the advantage of widespread access versus the decline in quality and, perhaps, appreciation. while it's nice to be able to get a refrigerator magnet featuring Van Gogh's Starry Night, the very ease of acquiring such things necessarily takes away some of their magic). According to the bio at the conclusion of the book (which was obviously added post-1987), Boorstin died in 2004, just at the cusp of the next development of the image in culture. For as Facebook, YouTube, and Instagram have taken off, images have quickly come to dominate the internet. Although Boorstin may never have seen a selfie, I doubt if he'd be surprised as it's the next logical step in everything he was describing. The Image is a kind of reactionary critique and rant on a single topic, albeit an important one. Like many thinkers trying to prove a very broad point, Boorstin may take his argument too far in some cases. He tries to draw sharp divisions between hero and celebrity, real events and pseudo-events and images and ideals. I'm not sure it's quite so straightforward. Plato's Socratic dialogues, written more than 2000 years ago, largely dealt with the difference between appearance and reality. In fact, it's almost surprising that Boorstin doesn't mention Plato's Allegory of the Cave, which has enjoyed a resurgence of popularity recently. Plato discusses how shadows, or images, are mistaken as reality by the ignorant masses. Perhaps Boorstin doesn't reference this classic because it would have undercut his thesis, namely that The Image is a relatively modern phenomenon. While the forces Boorstin identifies in The Image may not be as starkly new as he supposes, they certainly accelerated greatly in his time and even more so in our current time. I often find it instructive to read sociological viewpoints from earlier decades to see how modern trends got started. In the case of The Image, we're dealing with one of the central issues of our time. For even if images were an issue as far back as Plato's time, they certainly didn't dominate the everyday consciousness of people as they do now. This is a complex issue and, as much as I enjoyed reading The Image, I don't think it really does much good to simply rail against cultural trends. Today we have a host of anti-internet critics who are telling us how current technology is dumbing everyone down. While they have a point, there are other ways to look at it as well. Images are only getting more central to our existence. Does this mean we're sinking further into the realm of Plato's cave dwellers, the Maya of Buddhism or perhaps the complacent citizens of Aldous Huxley's Brave New World? Perhaps. However, there are always multiple ways to look at everything. There can be truth and beauty in images as well. I loved reading it and have been enjoying talking about it. For a book that was published in the 60s, it was pretty compelling how relevant it is today. It puts under the magnifying glass themes such as hero vs. celebrity and how we allow daily, hourly, minute-to-minute information into our lives and try to paint it as meaningful. Over-saturation makes one common. Boorstin deconstructs how we travel these days - how often we seek to find, if not expect, the comfortable and familiar in places tha I loved reading it and have been enjoying talking about it. For a book that was published in the 60s, it was pretty compelling how relevant it is today. It puts under the magnifying glass themes such as hero vs. celebrity and how we allow daily, hourly, minute-to-minute information into our lives and try to paint it as meaningful. Over-saturation makes one common. Boorstin deconstructs how we travel these days - how often we seek to find, if not expect, the comfortable and familiar in places that theoretically should be unfamiliar. I can't say how it's 100% a bad thing, per se, but I see his point. "The more strenuously and self-consciously we work at enlarging our experience, the more pervasive the tautology becomes." Self-consciousness destroys the experience. I get that; it can be a challenge to read and watch stuff that is self-conscious. But it's inherent in so much of what we do. I suppose that detachment, that ability to reflect what one sees without tainting it with too much of an agenda makes the great creators great. This book also made me think about all the images I am bombarded with in daily life. Facebook posts, restaurant signs, Instagram photos, television programming… It's up to me to buy into them, shut them out, or, perhaps observe from a safe distance. "There was a time when the reader of an unexciting newspaper would remark, 'How dull is the world today!' Nowadays he says, 'What a dull newspaper!' " says the author. This book is Boorstin's diatribe against the promotion of "image" over reality. His denunciation is even more relevant today, 50 years after it was published (consider not just regular TV news, but the explicitly party-line hacks who pose as reporters and spend time on trivial issues; and, Jon Stewart who pretends to be a comedian "There was a time when the reader of an unexciting newspaper would remark, 'How dull is the world today!' Nowadays he says, 'What a dull newspaper!' " says the author. This book is Boorstin's diatribe against the promotion of "image" over reality. His denunciation is even more relevant today, 50 years after it was published (consider not just regular TV news, but the explicitly party-line hacks who pose as reporters and spend time on trivial issues; and, Jon Stewart who pretends to be a comedian to comment on the news). Boorstin's book is not a balanced presentation of both sides of the questions he ponders. He's got a point to make, and by God he'll make it. This undercuts the chapters where he tries to extend his argument against things like packaged tours. Still, it is worth pushing through those curmudgeonly Luddite broadsides because every chapter will also question some aspect of modern life. This is a curious book. Everyone reads this book when they take Media Studies classes in college. When in college, the student reading the book is usually on the good side of history. The problem is after graduation. In college, this book can help make a person a better anti-capitalist, but soon after graduation this book gets dusted off and packed away into the suitcase that the former idealist takes to countless job interviews at marketing firms. This book is a lot like art school: it sounds li This is a curious book. Everyone reads this book when they take Media Studies classes in college. When in college, the student reading the book is usually on the good side of history. The problem is after graduation. In college, this book can help make a person a better anti-capitalist, but soon after graduation this book gets dusted off and packed away into the suitcase that the former idealist takes to countless job interviews at marketing firms. Inciteful look at trends in media and modern life. Saw a lot in the early 1960s that would still be important shapers of life in the early twenty-first century. The deluge of media and pseudo events that now largely make up our screenspace these days. Provocative though a little "get off my lawn!". As we Americans obsess over fake news and alternative facts in the wake of Trump's presidential election, Daniel Boorstin's 55 year-old reflection on the proliferation of "pseudo-events" in American life reminds us that "fake" is a spectrum, and we're very nearly blind to all but the most extreme end. Here, Boorstin awakens us to the artifice of press conferences, debates, opinion polls, leaks, etc. etc. which we now generally accept as "real" news. If this book were written today, it would almo As we Americans obsess over fake news and alternative facts in the wake of Trump's presidential election, Daniel Boorstin's 55 year-old reflection on the proliferation of "pseudo-events" in American life reminds us that "fake" is a spectrum, and we're very nearly blind to all but the most extreme end. Here, Boorstin awakens us to the artifice of press conferences, debates, opinion polls, leaks, etc. etc. which we now generally accept as "real" news. If this book were written today, it would almost surely fall to our contemporary pressure to present solutions with any societal critique. Boorstin refuses, and in fact insists that any attempt to expose pseudo-events only results in reinforcing them. "One of our grand illusions is our belief in a 'cure.' There is no cure," he states with depressing fatalism. By the end of the book, that fatalism feels well founded. 55 years later, the societal patterns he recognizes are all the more entrenched. What he [Boorstin] may not have realized, however, is the extent to which the emergence of peer-to-peer networking technologies may eventually challenge the preeminence of the image factory from which he recoiled. If Rushkoff were writing this in the 90s, when the internet was still heavily text, I might forgive him his naïveté. But he wrote this in 2012, more than five years after LonelyGirl15, psuedo-event par excellence. Now, five years later, the image factory has produced President Macho Camacho Trump. Still, there is room to critique Boorstin's critique. When he derides artificial modern tourism compared to the lost art of travel, he quickly dismisses the advantage of increased access, since the form of travel he praises can only (practically-speaking) be available to the fantastically wealthy. I would be more willing to follow along if he were more willing to admit he is extolling the virtues of aristocracy over democracy. I actually tend to agree with him that we often praise "progress" without admitting what we've left behind, but I think this book falls into the opposite pattern: lamenting all we've left behind without acknowledging the disadvantages we've overcome. Boorstin also presents a critique of "celebrity" compared to "hero," which is all well and good, except he fails to explain why the "hero" is such a valuable social concept. It's not just that Boorstin believes pure-celebrities (like Zsa Zsa Gabor in his time and Paris Hilton in ours) are less worthy of attention than truly heroic types. He also criticizes the fact that we now want to humanize our heroes and recognize their flaws. I have trouble understanding why we would want idealized heroes rather than human ones. Isn't it recognition of human complexity a good thing? I suspect that my point of view here is a product of my times and that Boorstin would have an interesting answer. Sadly, he doesn't even try to justify the value of idealized heroes over human ones. It's as though he thinks the answer is so obvious it need not be explained. Today in entertainment Nicki Minaj tweeted that Taylor Swift parked in a handicapped spot and laughed while a 87 year old woman had to push her walker 3 blocks to her chemotherapy appointment. Swift quickly accused Minaj of bathing in the tears of infants upon whom she extinguishes her lit cigarettes. In case you haven’t noticed, much of what passes for ‘news’ these days is anything but. It’s a mish-mash of public relations, opinion, trial balloons, 2nd hand stories, press conferences, spin, a Today in entertainment Nicki Minaj tweeted that Taylor Swift parked in a handicapped spot and laughed while a 87 year old woman had to push her walker 3 blocks to her chemotherapy appointment. Swift quickly accused Minaj of bathing in the tears of infants upon whom she extinguishes her lit cigarettes. In case you haven’t noticed, much of what passes for ‘news’ these days is anything but. It’s a mish-mash of public relations, opinion, trial balloons, 2nd hand stories, press conferences, spin, advertising, ginned up controversy and filler material intended to satisfy the round-the-clock news cycle. Daniel Boorstin calls these occurrences “pseudo-events” and roughly defines them as “events that are manufactured solely in order to be reported”. In an off-the-record conversation today a top security official revealed that citizens can circumvent NSA spying through the use of a thin aluminum barrier, formed into a three-dimensional geometric shape tapering smoothly from a circular flat base to a point and placed over the cerebrum. NSA officials were unavailable for comment. 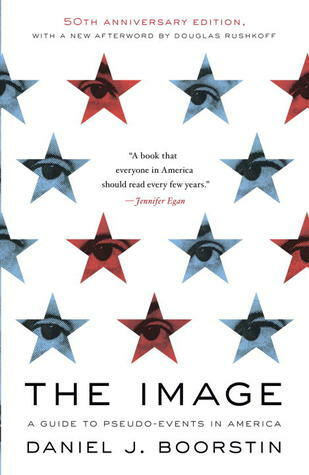 The Image: A Guide to Pseudo-Events in America describes the art of the non-event and the symbiotic relationship between the purveyors of pseudo-news and the media. The book was first published in 1962 and it’s safe to say that fake news has been proliferating exponentially ever since. While this activity is sometimes malicious it is most often benign in terms of its effect. Even so, Boostin seems to disapprove mainly because it serves to provide an inaccurate or distorted portrayal of reality. Boorstin then goes on to decry the absence of heroes in modern life claiming that they’ve been replaced instead by ‘celebrities’ whose primary characteristic is being “known for their well-knownness”. Unfortunately Boorstin largely gets it wrong. The reality is that true heroes can only exist in the past. By necessity they must die, be mythologized and their human frailties forgotten in order to become heroic. To bemoan that there are no modern heroes is akin to bemoaning the fact that there are no modern fossils. Breaking News: We interrupt our regularly scheduled program to bring you this exclusive report … Donald Trump eating a hotdog. There are several other essays in which Boorstin bemoans a lack of authenticity in such activities as travel (Boorstin claims that Americans going to remote parts of the world have been transformed from travelers into tourists) and cheap reproductions of artwork, books, movies and music (which he feels cheapens the original versions). But Boorstin has largely run out of steam by this point in the text and the essays take on the fuddy-duddy tone of an old man politely asking neighborhood kids to kindly remove themselves from his manicured greensward. I had heard positive things about the book, yet I couldn’t help thinking the entire time I was reading that Boorstin’s primary talent is comprised of a keen eye for the blatantly obvious. Do people really need to be told that most of what passes for news is crap? That the Mexico World Showcase at Epcot Center isn’t the same thing as being in Mexico? That the characters people play on TV and in the movies are different from the actors themselves? I can’t imagine that this would come as an astounding revelation to anyone. Yet to Boorstin these things are symptomatic of the phoniness he sees everywhere around him. In my mind the book amounts to so much ‘intellectual wankery’. In this case the wankery takes the form of post hoc, superficially ‘reasoned’ arguments for stuff Boorstin never liked in the first place. And there’s a lot he doesn’t like … the kids these days with their recorded music and paperback books and packaged vacations and movie stars and Reader’s Digests and TV news and airplanes and best-sellers and public relations and picture cameras and Muzak and museums and publicists and art reproductions and screenplays and hi-fi stereos and corporate logos and anything that’s considered popular and everything else that a self-proclaimed authenticity expert like Boorstin deems to be fakery and while you’re at it get off my damn lawn! Reads like it was written in the last year rather than the 60s. Boorstin was prophetic in his description of American culture. Boorstin introduces the idea of a "pseudo-event", the event created for the purpose of coverage. Interesting reflection on the dominance of imagery. The seminal non-academic work on media studies. Along with Walter Lippmann's Public Opinion, it forms an indispensable diptych for understanding how politics and culture mediate our democracy. This review has been hidden because it contains spoilers. To view it, click here. A criticism of the false reality that the media produces. A critical point that Boorstin made was that we demanded this false reality. We wanted a reality that exceeded what was actually out there. "Every day seeing there and hearing there takes the place of being there." "Having read a good deal about the villains who are said to be responsible for our perplexity - the hidden persuaders, the organization men, Madison Avenue, Washington bureaucracy, the eggheads, the anti-intellectuals, the A criticism of the false reality that the media produces. A critical point that Boorstin made was that we demanded this false reality. We wanted a reality that exceeded what was actually out there. "Having read a good deal about the villains who are said to be responsible for our perplexity - the hidden persuaders, the organization men, Madison Avenue, Washington bureaucracy, the eggheads, the anti-intellectuals, the power elite, etc., etc., etc. - I am unimpressed by their villainy. But I remain impressed by the perplexity of life in twentieth-century America. I have long suspected that our problems arise less from our weaknesses than from our strengths. From our literacy and wealth and optimism and progress." "We want and we believe these illusions because we suffer from extravagant expectations. We expect too much of the world. Our expectations are extravagant in the precise dictionary sense of the word - "going beyond the limit of reason or moderation." They are excessive." "We expect anything and everything. We expect the contradictory and the impossible. We expect compact cars which are spacious; luxurious cars which are economical. We expect to be rich and charitable, powerful and merciful, active and reflective, kind and competitive. We expect to be inspired by mediocre appeals for "excellence," to be made literate by illiterate appeals for literacy. We expect to eat and stay thin, to be constantly on the move and ever more neighborly, to go to a "church of our choice" and yet feel its guiding power over us, to revere God and to be God. Never have people been more the masters of their environment. Yet never has a people felt more deceived and disappointed. For never has a people expected so much more than the world could offer." "We tyrannize and frustrate ourselves by expecting more that the world can give us or than we can make of the world." "Nowadays everybody tells us that what we need is more belief, a stronger and deeper and more encompassing faith. A faith in America and in what we are doing. That may be true in the long run. What we need first and now is to disillusion ourselves. What ails us most is not what we have done with America, but what we have substituted for America. We suffer primarily not from our vices or our weaknesses, but from our illusions. We are haunted, not by reality, but by those images we have put in place of reality. To discover our illusions will not solve the problems of our world. But if we do not discover them, we will never discover our real problems. To dispel the ghosts which populate the world of our making will not give us the power to conquer the real enemies of the real world or to remake the real world. But it may help us discover that we cannot make the world in our image. It will liberate us and sharpen our vision. It will clear away the fog so we can face the world we share with all mankind." "Once the celebration has been held, the celebration itself becomes evidence that the hotel really is a distinguished institution. The occasion actually gives the hotel the prestige to which it is pretending." (2) It is planted primarily (not always exclusively) for the immediate purpose of being reported or reproduced. Therefore, its occurrence is arranged for the convenience of the reporting or reproducing media. Its success is measure by how widely it is reported. Time relations in it are commonly fictitious or factitious; the announcement is given our in advance "for future release" and written as if the event had occurred in the past. The question, "Is it real?" is less important than, "Is it newsworthy?" (3) Its relation to the underlying reality of the situation is ambiguous. Its interest arises largely from this very ambiguity. Concerning a pseudo-event the question, "What does it mean?" has a new dimension. While the news interest in a train wreck is in what happened and in the real consequences, the interest in a interview is always, in a sense, in whether it really happened and in what might have been the motives. Did the statement really mean what it said? Without some of this ambiguity a pseudo-event cannot be very interesting. (4) Usually it is intended to be a self-fulfilling prophecy. The hotel's thirtieth-anniversary celebration, by saying that the hotel is a distinguished institution, actually makes it one." "The telecast was made to conform to what was interpreted as the pattern of viewers' expectations." (1) Pseudo-events are more dramatic. A television debate between candidates can be planned to be more suspenseful (for example, by reserving questions which are then popped suddenly) than a casual encounter or consecutive formal speeches planned by each separately. (3) Pseudo-events can be repeated at will, and thus their impression can be re-reinforced. (4) Pseudo-events cost money to create; hence somebody has an interest in disseminating, magnifying, advertising, and extolling them as events worth watching or worth believing. They are therefore advertised in advance, and rerun in order to get money's worth. (5) Pseudo-events, being planned for intelligibility, are more intelligible and hence more reassuring. Even if we cannot discuss intelligently the qualifications of the candidates or the complicated issues, we can at least judge the effectiveness of a television performance. How comforting to have some political matter we can grasp! (6) Pseudo-events are more sociable, more conversable, and more convenient to witness. Their occurrence is planned for our convenience. The Sunday newspaper appears when we have a lazy morning for it. Television programs appear when we are ready with our glass of beer. In the office the next morning, Jack Paar's (or any other star performer's) regular late-night show a the usual hour will overshadow in conversation a casual event that suddenly came up and had to find its way into the news. (7) Knowledge of pseudo-events - of what has been reported, or what has been staged, and how - becomes the test of being "informed." News magazines provide us regularly with quiz questions concerning not what has happened but concerning "names in the news" - what has been reported in the news magazines. Pseudo-events begin to provide that "common discourse" which some of my old-fashioned friends have hoped to find in the Great Books. (8) Finally, pseudo-events spawn other pseudo-events in geometric progression. They dominate our consciousness simply because there are more of them, and ever more." "The celebrity in the distinctive modern sense could not have existed in any earlier age, or in America before the Graphic Revolution. The celebrity is a person who is known for his well-knownness. His qualities - or rather his lack of qualities - illustrate our peculiar problems He is neither good nor bad, great nor petty. He is the human pseudo-event. He has been fabricated on purpose to satisfy our exaggerated expectations of human greatness. He is morally neutral. The product of no conspiracy, of no group promoting vice or emptiness, he is made by honest, industrious men of high professional ethics doing their job, "informing" and educating us. He is made by all of us who willingly read about him, who like to see him on television, who by recordings of his voice, and talk about him to our friends. His relation to morality and even to reality is highly ambiguous. He is like the woman in an Elinor Glyn novel who describes another by saying, "She is like a figure in an Elinor Glyn novel."" "No longer external sources which fill us with purpose, these new-model "heroes" are receptacles into which we pour our own purposelessness. They are nothing but ourselves seen in a magnifying mirror. Therefore the lives of entertainer-celebrities cannot extend our horizon. Celebrities populate our horizon with men and women we already know." "A woman reveals her age by the celebrities she knows." "As soon as a hero begins to be sung about today, he evaporates into a celebrity." "When the traveler's risks are insurable he has become a tourist." "Now, when one risks so little and experiences so little on the voyage, the experience of being there somehow becomes emptier and more trivial. When getting there was more troublesome, being there was more vivid. When getting there is "fun," arriving there somehow seems not to be arriving any place." "Whether we seek models of greatness, or experience elsewhere on the earth, we look into a mirror instead of out a window, and we see only ourselves." "Like all great inventions, the idea was beautifully simple. It was merely to "plant" a full-length article (prepared under Reader's Digest direction) in some other magazine, so it could afterwards be digested in The Reader's Digest." "Whatever the motives, the effect was plain enough. The magazine whose initial appeal was its ability to survey the scene, was now itself making the scene to be surveyed. Like the political interview or the tourist attraction, the planted article was produced in the honest effort to do a job, to give people what they paid for and what they expected." "In the age of Graphic Revolution people quite naturally prefer a shadow of a shadow to a shadow of an original." "The American publishing scene has been dominated by a few stars - Ernest Hemingway, Norman Mailer, J.D. Salinger - who have prospered as authors partly because they could be touted as "personalities."" "To attack as a "rationalization" became a kind of philosophic penicillin - a layman's cure-all for arguments he could not understand or would not take seriously." "Oversimplified sociological concepts - "status," "other-direction," etc. - appealed because they were so helpful in building images. These wide-appealing "modes," expressed in our dominating notion of norms and averages, led us unwittingly to try to imitate ourselves. We have tried to discover what it is really like to be a junior executive or a junior executive's wife, so we can really be the way we are supposed to be, that is, the way we already are. Naive emphasis on ideals had at worst tempted men to unrealistic pursuit of an abstract standard of perfection; emphasis on modes and images now tempts us to pursue the phantoms of ourselves." "The momentous sign of the rise of image-thinking, and its displacement of ideas is, of course, the rise of advertising. Nothing has been more widely misunderstood. Daring not to admit we may be our own deceivers, we anxiously seek someone to accuse of deceiving us. "Madison Avenue," "Public Relations," "Organization Men," and similar epithets have given us our whipping boys. We refuse to believe that advertising men are at most our collaborators, helping us make illusions for ourselves. In our moral indignation, our eagerness to find the villains who have created and frustrated our exaggerated expectations, we have underestimated the effect of the rise of advertising. We think it has meant an increase of untruthfulness. In fact it has meant a reshaping of our very concept of truth." "It is more important that a statement be believable than that it be true." "They would not put their names to a statement unless it were true, the readers believe, so that it is of little consequence that the actual choice of the words used to convey their approval of Rheingold is the work of another hand." "The rise of images and of our power over the world blurs rather than sharpens the outlines of reality - permeates one after another area of our life. There is hardly a corner of our daily behavior where the multiplication of images, the products and by-products of the Graphic Revolution, have not befogged the simplest old everyday distinctions." "Pressure to participate leads to more and more nominal membership: in churches, service clubs, professional societies, pressure groups, charitable organizations, and political associations. Our joining is itself one of the most perfunctory of pseudo-events. We wish our membership to be reported. We do not care to participate." "New ambiguities enter into "desire" and "function." Does the public really want fins on its new-model automobiles? If the fins do satisfy a public want, are they not then somehow functional? We become more and more confused about our desires in an ever expanding economy where products are always remoter from primitive needs." "A dream is a vision or an aspiration to which we can compare reality. It may be very vivid, but its vividness reminds us how different is the real world. An illusion, on the other hand, is an image we have mistaken for reality. We cannot reach for it, aspire to it, or be exhilarated by it; for we live in it. It is prosaic because we cannot see it is not fact." "Yet now, in the height of our power in this age of the Graphic Revolution, we are threatened by a new and a peculiarly American menace. It is not the menace of class war, of ideology, of poverty, of disease, of illiteracy, of demagoguery, or of tyranny, though these now plague most of the world. It is the menace of the unreality. The threat of nothingness is the danger of replacing American dreams by American illusions. Of replacing the ideals by the images, the aspiration by the mold. We risk being the first people in history to have been able to make their illusions so vivid, so persuasive, so "realistic" that they can live in them. We are the most illusioned people on earth. Yet we dare not become disillusioned, because our illusions are the very house in which we live; they are our news, our heroes, our adventure, our forms of art, our very experience." "It is synthetic. It is believable. It is passive. It is concrete. It is simplified, and it is ambiguous." "Images are the pseudo-events of the ethical world. They are at best only pseudo-ideals. They are created and disseminated in order to be reported, to make a "favorable impression." Not because they are good, but because they are interesting." "Discovering we cannot have another people's virtues, we call them vices." "In our popularity game we ask the world not, "Do you like me?" but, "Do you like my shadow?"" "We mistake our shadows for ourselves. To us they seem more real than the reality. Why should they not seem so to others? Out technique seems direct only because in our own daily lives the pseudo-event seems always destined to dominate the natural facts. We no longer even recognize that our technique is indirect, that we have committed ourselves to managing shadows. We can live in our world of illusions. Although we find it hard to imagine, other people still live in the world of dreams. We live in a world of our making. Can we conjure others to live there too? We love the image, and believe it. But will they?" "It was disturbing, he said, to hear yourself quoted to yourself by somebody else who thought it was himself speaking: you began to wonder whether it was your language after all." "We no longer do a job; we play a role. We do not learn parental virtues; instead we are prompted on how to "play the role of" parents." "People really struggling to win, and not merely to have their victory reported in the papers." "One of the deepest and least remarked features of the Age of Contrivance is what I would call the mirror effect. Nearly everything we do to enlarge our world, to make life more interesting, more varied, more exciting, more vivid, more "fabulous," more promising, in the long run has an opposite effect. In the extravagance of our expectations and in our ever increasing power, we transform elusive dreams into graspable images within which each of us can fit. 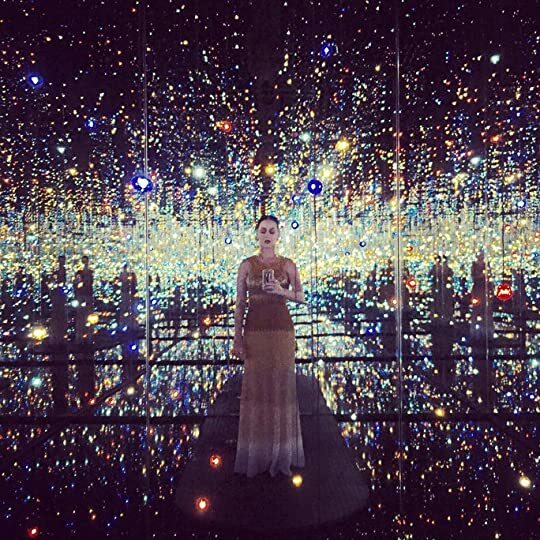 By doing so we mark the boundaries of our world with a wall of mirrors. Our strenuous and elaborate efforts to enlarge experience have the unintended result of narrowing it. In frenetic quest for the unexpected, we end by finding only the unexpectedness we have planned for ourselves. We meet ourselves coming back." "More and more of our experience thus becomes invention rather than discovery. The more planned and prefabricated our experience becomes, the more we include in it only what "interests" us. Then we can more effectively exclude the exotic world beyond our ken: the very world which would jar our experience, and which we most need to make us more largely human. The criterion of well-knownness overshadows others, because the well-known is by definition what most people already know. We seek celebrities, not only among men and women but even among books, plays, ideas, movies, and commodities. We make our whole experience a "reader's digest" where we read only what we want to read, and not what anyone else wants to write. We listen for what we want to head and not for what someone wants to say. We talk to ourselves, without even noticing that it is not somebody else talking to us. We talk to ourselves about what we are supposed to be talking about. We find this out by seeing what other people are talking to themselves about. "All I know," Will Rogers remarked in the earlier days of the Graphic Revolution, "is what I read in the papers." Today he might modernize his complaint: "All I see in the papers is what I already know." "All I see in the papers is what I already know." "We have fallen in love with our own image, with images of our making, which turn out to be images of ourselves." "At home we begin to try to live according to the script of television programs of happy families, which are themselves nothing but amusing quintessences of us." "More and more accustomed to testing reality by the image, we will find it hard to retain ourselves so we may once again test the image by reality. It becomes ever harder to moderate our expectations, to shape expectations after experience, and not vice versa." "We are deceived and obstructed by the very machines we make to enlarge our vision." "Our discontent begins by finding false villains whom we can accuse of deceiving us. Next we find false heroes whom we expect to liberate us. The hardest, most discomfiting discovery it that each of us must emancipate himself. Though we may suffer from mass illusions, there is no formula for mass disenchantment. By the law of pseudo-events, all efforts at mass disenchantment themselves only embroider our illusions." "While we have given other great power to deceive us, to create pseudo-events, celebrities, and images, they could not have done so without our collaboration. If there is a crime of deception being committed in America today, each of us is the principal, and all others are only accessories." "It is dangerously tempting to treat our illusions by compounding them." Boorstin gets a little too cynical in parts, but even then, his words are incredibly profound. An unusual book for sure, a mix of insight and snobbishness, but most importantly a fascinating look at a topic I've become increasingly interested in the last few years: the problem of unreality. Boorstin's main concept in this book is the pseudo-event. A pseudo event is an event that is planned or coordinated solely for the purpose of being reported and publicized. It is almost inherently a child of mass culture and mass media. Today, pseudo-events are so woven into our daily lives that it tak An unusual book for sure, a mix of insight and snobbishness, but most importantly a fascinating look at a topic I've become increasingly interested in the last few years: the problem of unreality. Boorstin's main concept in this book is the pseudo-event. A pseudo event is an event that is planned or coordinated solely for the purpose of being reported and publicized. It is almost inherently a child of mass culture and mass media. Today, pseudo-events are so woven into our daily lives that it takes an earlier historical context (the 1950s) to show how they might have been seen as new. The prototypical pseudo-events were press conferences, interviews, debates, and other publicity type events. The focus here is on making news, and Boorstin suggests there is a symbiotic relationship between politicians who want to curate their public image and constantly communicate with the public . Boorstin suggests that a fixation with images rather than reality and with pseudo-events have spread into the broader culture. A celebrity, for instance, was someone who was famous simply for being famous, and he did tons of things just to be seen. Life was increasingly prepared, pre-packaged, homogenized, and curated for the public. Complex books are whittled down to abridged versions and simplistic movies. The rise of public relations firms are the strongest evidence of this. He makes the very insightful point that advertising was filling the world with pseudo-events, like the release of a new car model each year even though the planning for each model went several years back. He argues that, for the most part, the American people have grown comfortable living in this unreality and are having increasing trouble distinguishing the image from reality. They increasingly ask "How does this look?" rather than "What is this really?" in regard to politicians, products, and events. They are flattered by the lengths to which advertisers and politicians go to appeal to them. They like the appearance of spontaneity but not the disturbances of real spontaneity. Boorstin sees a growing symbiosis between the makers and consumers of images, although he adds that people's craving for the truly random and meaningful is manifested in a growing obsession in sports, one part of life that truly cannot be scripted. This is a bit of a 20th century jeremiad, and I think Boorstin gets carried away from time to time. His criticism of modern tourism I thought was kind of silly: yes, most people want their rare, expensive trips abroad to be well-scheduled and safe; no, there's nothing really wrong with that. On the whole, however, I found this book to be both thoughtful and concerning. I wish he had kept going a little bit and asked what this all meant for democracy. Obviously, it would also be cool if he could update this book for the last 60 years of American history. I found a significant parallel with his criticism of the increasing fine-tuning of people's public images in social media. In his day, it was only the famous and powerful who could do this kind of obsessive curating. Now, every person can do it through their extensive social media presences: the right Instagram filter and photo, the funniest tweets, the hottest takes, etc etc. We increasingly see ourselves as other people see us, and I worry about the health of people's interior lives and identities in such a world. Of course, I don't think Boorstin could have fathomed the flood of information to which we are exposed today, and this book doesn't offer many clues as to what he would think. Boorstin is a good writer and has a good command of his sources (as evidenced by his thirty page supplemental essay on further reading). There is significant value in this book; the criticisms he levels against American culture are still stinging more than fifty years on. However, many of these criticisms are based on a historical argument that Boorstin draws. I question this historical argument. Boorstin believes that America’s early embrace of ideals devolved into the acceptance and conveyance Boorstin is a good writer and has a good command of his sources (as evidenced by his thirty page supplemental essay on further reading). There is significant value in this book; the criticisms he levels against American culture are still stinging more than fifty years on. However, many of these criticisms are based on a historical argument that Boorstin draws. I question this historical argument. Boorstin believes that America’s early embrace of ideals devolved into the acceptance and conveyance of images. According to Boorstin, this embrace of images over ideals has contributed to the rise of celebrity, the shallowness of news, the advent of tourism, and an explosion in materialism. Importantly, he believes that these are new currents in American culture, directly stemming from the Graphic Revolution (which Boorstin dates to the invention of dry-plate photography in 1873 (13)). First, materialism was hardly new. In the 1830s, a foreigner, Alexis de Tocqueville observed Americans’ materialist predisposition: “While not everyone experiences it in the same way, all feel it. Minds are universally preoccupied with meeting the body’s every need and attending to life’s little comforts” (617, Goldhammer translation). He continues, “Love of well-being has become the national and dominant taste. The mainstream of the human passions runs in this direction and sweeps everything along with it” (619). Second, Boorstin's lamentation that the decline of American ideals is responsible for cultural and civic decline ignores the historical events of the period preceding the Graphic Revolution. Slavery and Indian removal belied the promise of American ideals in the period before the Graphic Revolution. Boorstin fails to wrestle with these historical voices. Neither Douglass or Tocqueville are directly or indirectly alluded to in the text, or listed in the index. Acknowledgement would disrupt the narrative that braces Boorstin’s historical argument. It is unsurprising that Boorstin embraces historians like Francis Parkman and George Bancroft (201), while writing off Charles Beard, Frederick Jackson Turner, and Richard Hofstadter (52 & 202). He writes, “Social scientists no longer focused on the unique event that had fascinated the old humanist-historians. Instead they themselves built up images. These soon dominated the ways in which literate Americans thought about themselves. Americans tried to fit themselves into social science images of the frontier, economic classes, and status” (201-202). Boorstin dismisses these histories because the “images” they contain would undermine his argument. To say that Boorstin is hyperbolic in his takedown of what modern media is doing to society would be, well, rather understating the truth. Boorstin is *instensely* hyperbolic at places as he makes his diagnosis of just what the "Graphic Revolution" is doing to America. What is worth noting, however, is that Boorstin's emotion and bombastic writing really does emerge from a deep-seated love and concern for American society, so perhaps he can't be faulted for this. Originally published in 1962, The To say that Boorstin is hyperbolic in his takedown of what modern media is doing to society would be, well, rather understating the truth. Boorstin is *instensely* hyperbolic at places as he makes his diagnosis of just what the "Graphic Revolution" is doing to America. What is worth noting, however, is that Boorstin's emotion and bombastic writing really does emerge from a deep-seated love and concern for American society, so perhaps he can't be faulted for this. Originally published in 1962, The Image is really an extended description of what images have done to society, how they have changed attitudes and perspectives and even whole ways of living. Despite being perhaps a little overreaching in some of his diagnoses, Boorstin is undoubtedly right as to the effects such things are having on the average person's relationship to celebrities, to world travel, to foreign nations in general, and to the self. That his descriptions and understandings of these problems are just as relevant now as they were in 1962 speaks to the prescience of his voice and the overall nature of his almost prophetic character. Society does not get off easy in this book, nor should it. His argument really comes home in the volume's concluding chapter, which could read as a description of our very society. America is often not liked because of the image it puts out, because that image is unrelatable to other nations, and because it has become more important to us than the character of the nation that it is portraying. These things, I believe, are all just as true now as they were then--and probably more so. The solution, Boorstin argues, is that we must develop a practiced discontentedness with society as we know it, and need to stop trying to solve societal issues by compounding them--an advertising campaign to rehabilitate the image of advertising is beside the point, he argues. Is this written 50 years ago? I cannot believe it as this book is still so spot on. It all starts with us. We want news, all the time. However there are simply not enough real news that are of interest to us. (Alright there will always be sports news which are real news, but otherwise there is a paucity of news). So media companies create pseudo-events. Those are the press releases of politicians and basically anyone of significance. They are planned in advance and are not real ‘news’. Pseudo-ev Is this written 50 years ago? I cannot believe it as this book is still so spot on. It all starts with us. We want news, all the time. However there are simply not enough real news that are of interest to us. (Alright there will always be sports news which are real news, but otherwise there is a paucity of news). So media companies create pseudo-events. Those are the press releases of politicians and basically anyone of significance. They are planned in advance and are not real ‘news’. Pseudo-events spawn more pauses-events; soon we have commentators who comment on these and so on and so forth. Soon this creates a world where the Image is more important than the substance. We vote for people who look good and/or are more impressive on national debates but neglect the substance of their arguments. Public Relations as a profession grows and it is unthinkable for anyone who is someone to not to have a PR consultant or speech writers. They tell us how to speak, how to dress, sometimes down to the exact word or phrase, to craft our Image. Celebrities have images that are packaged. Brands sell advertisements about inspirations and images. Tourists visit countries in packaged tours that ensure minimal contact with the bothersome locals. We want to read digests, summaries or abridged versions of everything; then we want watch the movie adaptation of novels. Unfortunately although convenient, time-saving and visually vivid, they cannot engage us intellectually like the original. Worse still, sometimes the Image becomes our reality. We no longer know who we really are; we only know what our image is. Rather than feeling good about another person, we now say ‘he/she made a good impression’. Furthermore, despite knowing advertisements show fake images, we actually want to get deceived and expect them in our magazines. How to break through this? Boorstin suggests that we do more critical thinking, do some real travelling and read the original everything as much as we can. After 50 years, his words are even more pertinent to our time where we have become Instagram and Facebook people, literal Images of our real selves. This is one of those books that knock me off my chair! I picked up The Image after coming across references to it in Michiko Kakutani's The Death of Truth. She cited it for its influence on Baudrillard and other French philosophers, an early attempt to make sense of a world where representations had triumphed over reality. Boorstin explains how the "pseudo-event," that is a staged event—the political interview, the orchestrated for television convention, the advertisement, the adaptation—has come to be more important than the candidate, the issues, I picked up The Image after coming across references to it in Michiko Kakutani's The Death of Truth. She cited it for its influence on Baudrillard and other French philosophers, an early attempt to make sense of a world where representations had triumphed over reality. Boorstin explains how the "pseudo-event," that is a staged event—the political interview, the orchestrated for television convention, the advertisement, the adaptation—has come to be more important than the candidate, the issues, the product, or the original. Each chapter approaches his thesis in a different area of American life: politics, travel, publishing, the movies, etc. Consistent though across all the chapters is the idea that America was (the book was written in 1961) becoming less focused on who we are or what we hope to be and increasingly on how we are perceived. We were becoming a nation where the image mattered more than reality, where whether something seemed believable mattered more than whether it was true. He was, without a doubt, prescient. He was writing in what was, relatively, the infancy of television and the 24-hour news cycle (in his day limited to radio news on the hour and half-hour). Some of the chapters drag because the examples he uses to make his arguments no longer feel that compelling—do we care that much about Thomas Cook and American Express's travel services? The fact that abridged versions of classics were popular probably provokes less moral outrage than it does today. Much of it is, simply, dated. I would love to read Boorstin's take on travel in a world of Tripadvisor and flights cheaper than he could have imagined, while the studio system for creating Hollywood stars was likely more fascinating to readers in 1961 than it is today. Fake news! Or, if you prefer, Faux News! Ever think it's all contrived? You might just be right. Professor Boorstin looks at how our world is presented to us, flaked, formed, and processed to fit an image--of our country, a politician, a best-seller, an actor, a product--of just about anything, actually. We have "progressed" to the point where pseudo-events are presented as news and covered as such. For example: an event happens. Say a senator passes away after battling cancer. This is a real eve Fake news! Or, if you prefer, Faux News! Ever think it's all contrived? You might just be right. Professor Boorstin looks at how our world is presented to us, flaked, formed, and processed to fit an image--of our country, a politician, a best-seller, an actor, a product--of just about anything, actually. We have "progressed" to the point where pseudo-events are presented as news and covered as such. For example: an event happens. Say a senator passes away after battling cancer. This is a real event. But then a politician issues a press release about the senator's death, and the press release is covered as news. It's not; it's a pseudo-event, managed and finessed by the politician's handlers. Then another politician tweets about the press release--another pseudo-event, even further distanced from the actual news event. Then the talking heads are brought on TV to take one side or the other about the tweet, and we are devolving further and further away from the actual reality into an image of reality. The same thing happens in entertainment, best selling books, award shows. We have built a culture of celebrity, where one is well-known for being well-known (any Kardashian comes to mind). Is a best-selling book a best-seller because it sells well, or does it sell well because it's a best seller? Hmm? Daniel Joseph Boorstin was a historian, professor, attorney, and writer. He was appointed twelfth Librarian of the United States Congress from 1975 until 1987. He graduated from Tulsa's Central High School in Tulsa, Oklahoma, at the age of 15. He graduated with highest honors from Harvard, studied at Balliol College, Oxford as a Rhodes Scholar and earned his PhD at Yale University. He was a lawyer Daniel Joseph Boorstin was a historian, professor, attorney, and writer. He was appointed twelfth Librarian of the United States Congress from 1975 until 1987. He graduated from Tulsa's Central High School in Tulsa, Oklahoma, at the age of 15. He graduated with highest honors from Harvard, studied at Balliol College, Oxford as a Rhodes Scholar and earned his PhD at Yale University. He was a lawyer and a university professor at the University of Chicago for 25 years. He also served as director of the National Museum of History and Technology of the Smithsonian Institution. His The Americans The Democratic Experience received the 1974 Pulitzer Prize in history. Within the discipline of social theory, Boorstin’s 1961 book The Image A Guide to Pseudo-events in America is an early description of aspects of American life that were later termed hyperreality and postmodernity. In The Image, Boorstin describes shifts in American culture—mainly due to advertising—where the reproduction or simulation of an event becomes more important or "real" than the event itself. He goes on to coin the term pseudo-event which describes events or activities that serve little to no purpose other than to be reproduced through advertisements or other forms of publicity. The idea of pseudo-events closely mirrors work later done by Jean Baudrillard and Guy Debord. The work is still often used as a text in American sociology courses. When President Gerald Ford nominated Boorstin to be Librarian of Congress, the nomination was supported by the Authors League of America but opposed by the American Library Association because Boorstin "was not a library administrator." The Senate confirmed the nomination without debate.